There’s a misconception among the people that WordPress is just a blogging platform, where writers and their creativity are published for the world to see. So, why there’s a need for WordPress? Why not any other free tool over the internet? The concept where WordPress revolves around is based on a blogging website, but things have taken a turn and have gotten further away from that idea. Over the years as writers started using WordPress, the platform evolved into an exquisite Content Management System (CMS), where it’s just not about creating a blog, but a platform to create fully operational websites. A survey conducted calculated that WordPress powers more than 22.5% of all the website platforms on the internet while considering the immaculate size of it. Its unique, easy and caters to all your blogging and website requirements, gaining popularity among the masses. Its specialty is the features it provides, having those essential tools that attracted multinational brands such as eBay, New York Times, Google, Facebook, CNN, Disney and Sony in getting their businesses and websites run around WordPress. Thirsty to know more about it? 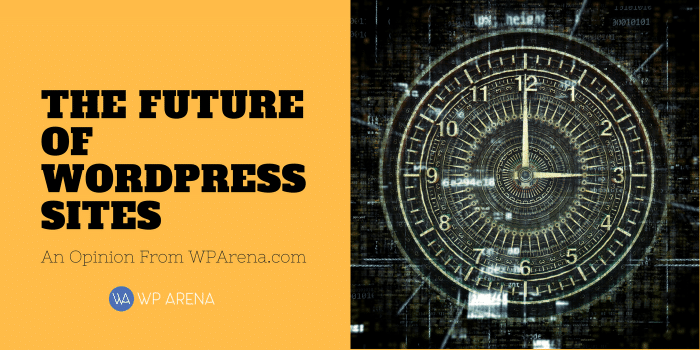 Having questions as to what holds for the future of WordPress websites? Let’s get into it. For the past 13 years, WordPress has fulfilled the need of the bloggers and businesses and reached their goals as aimed. Numbers speak it all. Since March 2016 WordPress is catering to 26.4% of the entire web globally, and it’s still pursuing its expertise. If you’ve been in the Digital Market, then you should know the earliest ventures you were involved in how the major firms lacked the adequate technology to make something big. Much applaud to WordPress as it changed how content creation is done through Online Marketing. As a Digital Marketer, having the sufficient and useful tools in your palm is key to launching and managing a good website from scratch. Why Online Marketers Love WordPress? Unlike WordPress, other CMS platforms aren’t easy to get used to; it may seem to be a challenge to operate or adapt to that platform. That’s not the case with WordPress as it’s a walk in the park making integration and migrating from different platforms to WordPress easier such as Tumblr, Drupal, and Joomla. While multiple guides can be seen on how to bring your content to WordPress. People confuse with a notion of publishing more content on WordPress will lead to more traffic on your content, making it rank on Google. That’s wrong. It is the Google-optimized CMS which permits you to swiftly create categories of pages for numerous topics on which you try to be ranked. Posting and publishing content on your social media accounts is above average while allowing your hopeful readers to share content on social media, alongside receiving analytics amongst the WordPress dashboard to make marketing efficient. Just as any other business of system, WordPress also became a victim of backlash having a terrible reputation when it proposed some critical security solutions for online marketers, with a notion of “complimenting it’s not meant for professional projects.” Then again, every business or project must have faced some bad days to rise from the ashes. Till date, WordPress has remade itself to an extent where even the famous Microsoft uses WordPress for its subsidiaries parts of its website (The Enterprise Website). Like it’s said, don’t judge a book by its cover. Same goes for WordPress. If you want to give it a try then type; WordPress.org. The website contains the support facility/forum where you will come across multiple experienced professionals who will guide you with direct and authentic responses. It’s more focused on those who lack coding skills and are not familiar with it but are making an effort to customize WordPress. As WordPress progressed, online marketing and handling the way content is being managed has transformed. Things have gotten mobile, as WordPress paved the way of being available on multiple devices. WordPress on mobile has its own app which is available on the famous Android and iOS to support content creation, comment moderation and checking of statistics while being on the go. Moreover, it integrates into all your business systems to manage your content efficiently. As an example, any user can connect to the business communications app Slack within WordPress. The new analytic software after its creation launched a new social network app which landed on the market, changing the basic fundamental design principles of the website change making you adopt and access WordPress websites for the latest trends. The platform is designed in a technical form that makes everything easier. While the primary concern is taken care of. Users don’t have to be tech giants or tech freaks to know the dimensions of WordPress, but when it leads to managing a hosting account, you need hosting for WordPress. With WordPress hosting, you do not require to look for technicalities. The platform itself will guide on along the way. WordPress developers and polyglots work hard to ensure a translation of platforms into as many languages as possible, and this will for sure continue in the future. More plugins and themes will be translating for your everyday use of WordPress. If you are waiting to use WordPress in your native language, then this will be your chance. Don’t be a party pooper and try how to contribute to WordPress. WordPress is a big name globally is attracting businesses on a daily basis. Any business or website will be recognized by its presentation and the way it’s being laid down to the end customer. Brand Equity plays a significant role in this, and it’s the end consumer commercial perception that uplifts your brand name. For that WordPress has played a vital role in engaging multiple brands. For further big names refer to https://vip.wordpress.com/ and WordPress giant sites. Future of WordPress websites seems to be in good shape. WordPress is for everyone and anyone who wants to expand their business and looking for a multi-functional integrated CMS. Whether it’s a start-up or a mature business, online marketers will be facilitated with new upgraded plugins and features to rebrand an entire business outlook. Multiple Content Management System appears on the web providing features as WordPress, but up till now WordPress is the leading CMS of the industry, and no other CMS can supersede it.